Set against sleek modern interiors designed by Charles Allem with a lush green Kowloon Park view on the third floor of The Mira Hong Kong, Michelin-recommended Cuisine Cuisine at The Mira showcases a dining experience that’s steeped in some of the most exacting Cantonese culinary traditions, serving top quality, authentic fare crafted by master chefs. 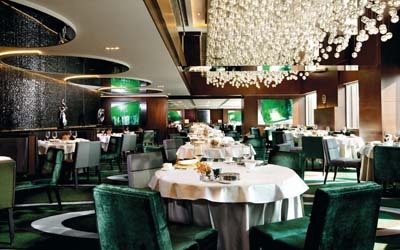 The restaurant offers extensive a la carte menu filled with famed signature dishes that carefully showcase the art of Cantonese cuisine, from revered Roasted Peking Duck to Braised Yoshihama Abalone and Sautéed Crystal King Prawn. Creative dim sum a la carte menu, as well as lunch and dinner set menus, change according to the seasonality respecting unique taste and freshness of the ingredients.